It’s the heart of wildfire season in Florida, and more than 90 percent of the state is in a drought. The National Drought Mitigation Center classified the situation as “severe” in nine counties Thursday. Florida Forest Service reports show that wildfires have scorched almost 60,000 acres since January 1st. State Climatologist David Zierden attributes the active fire season to the shortage of rain, which he says is unlikely to improve anytime soon. “April and May are very dry months climatologically speaking across Florida. The rainy season doesn’t really begin until late May and early June. Conditions are going to likely continue drying for the next couple of months”, said Zierden. The rainfall deficit began in most cities after Hurricane Matthew drenched the peninsula in early October. Gainesville’s 11.2” departure from normal tops the list published on the Southeast Regional Climate Center’s website. This is the second driest six-month period on record for the inland north Florida community. But Mr. Zierden points out that it’s more than just rainfall that gets factored into a drought declaration. “They [The National Drought Mitigation Center] take into account both short and long term rainfall deficits, various drought indices, stream flows, soil moisture, pasture and vegetation conditions. All of this is used to create the best depiction of drought in any particular area”, Zierden said. The current situation is considered a “short term drought”, since the abnormally dry pattern only dates back a few months. A long term drought, such as the one that recently ended in California, develops after years of unusually low rainfall accumulation. Oceanic temperature patterns can play a role into cycles of above or below normal rainfall in Florida. For example, the recent La Nina, which is a cool spell in the waters of the eastern Pacific Ocean, was a likely contributor to the warm and dry winter. In contrast, an El Nino (warmer Pacific waters), can often lead to above normal rainfall across the state. Based on this signal alone, Mr. Zierden says the long term prognosis is uncertain. “In January that La Nina fell apart, so we’re currently in neutral conditions in the Pacific Ocean. Right now, there’s really nothing to point to a wetter or drier rainy season this summer”, said Zierden. 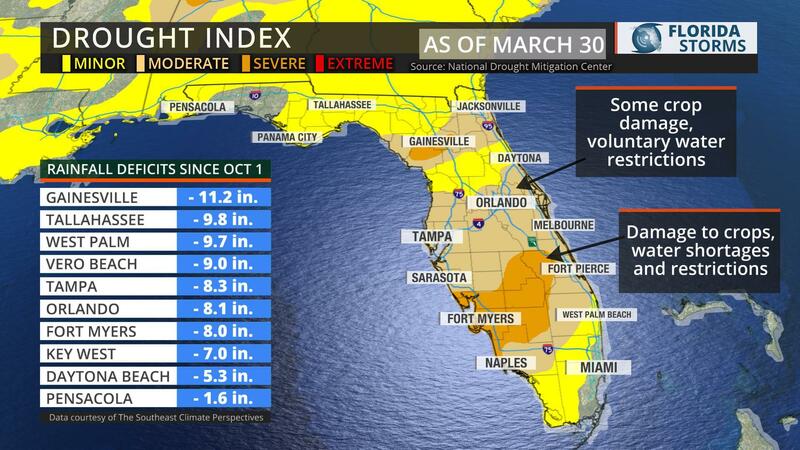 The current drought is not as severe as the one Floridians may recall in 2012, but it is the most notable event since. The official forecast from NOAA’s Climate Prediction Center is for “equal chances” of above or below normal rainfall over the next 90 days. April and May are typically two of the driest months of the year in Florida, but average rainfall more than doubles from May to June in most locations.